My girlfriend and I spent a week in Morocco as part of a larger European vacation. We had an amazing experience there, but I feel compelled to write a candid recap of what I would gladly repeat and what I would urge to do differently next time. I find travel books to be overly optimistic and unopinionated, so I hope my account of traveling will better set expectations. 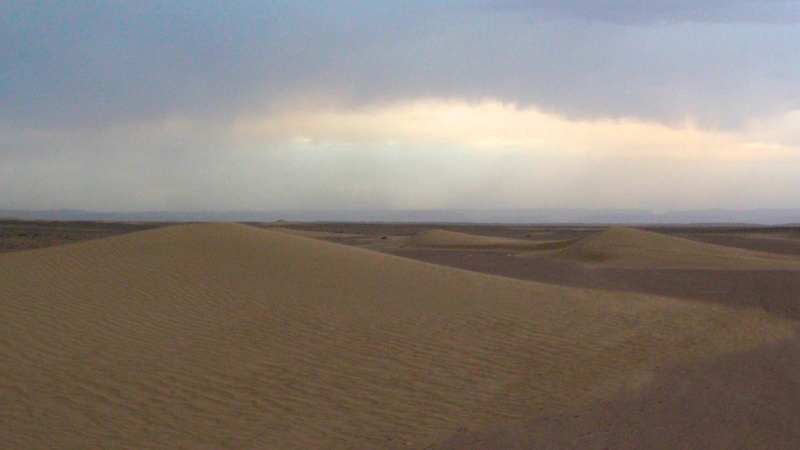 TL;DR: Roaming the Erg Chegaga Desert is what made our visit worthwhile. We added Morocco to our itinerary due to our desire for a more exotic segment of the trip as well as its close proximity to Spain. After skimming through a Lonely Planet on the subject, I became most interested in seeing Erg Chegaga. This section of the Sahara Desert in the eastern part of the country near the Algerian border is mostly conveniently accessed from Marrakech, so we flew in and out of there. We stayed at a guesthouse in the the Medina called Riad Chorfa. We were quite pleased with our hospitality, but we found the Medina itself to be vastly overrated. The Medina is a large medieval neighborhood of twisting alleys filled with souks selling goods Lonely Planet describes as “ranging from exotic spices to potions to cure any ailment”. 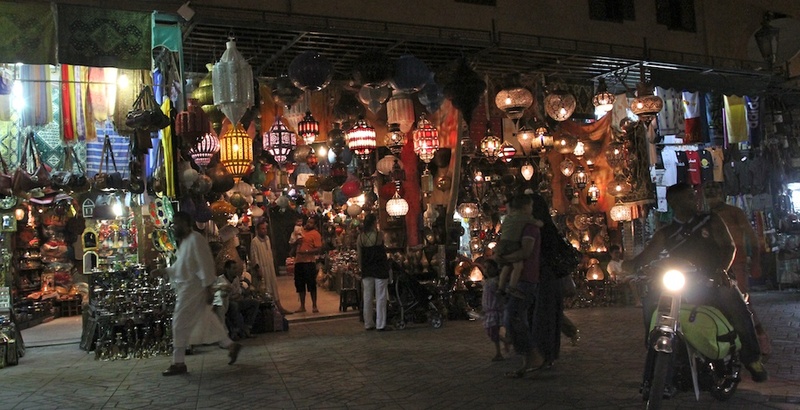 The book hypes these souks as one of the primary destinations in town, but we couldn’t leave them soon enough. The tacky motorcycle-ridden souks of the Medina. For every store selling spices or potions, there were ten selling knockoff Lional Messi jerseys. Combined with obnoxiously hustling shopkeepers and loud smelly motorcycles aggressively whizzing past you makes this a far from medieval experience l’ve had elsewhere. Other travelers mentioned that the neighboring city of Fez is a more tranquil and picturesque city center, but we didn’t have time to visit on this week long adventure. 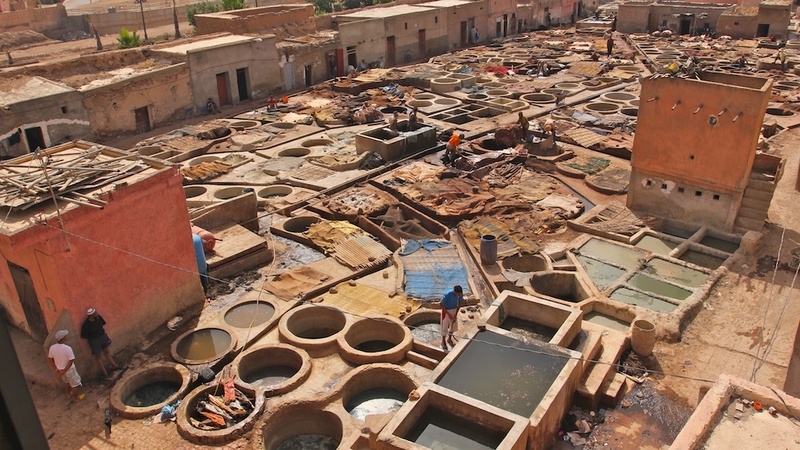 The leather tanneries were an interesting but smelly excursion, reinforcing Kaitlin's desires to be (mostly) vegan. There are redeeming parts of Marrakech. While its exterior architecture is nondescript, its interior architecture can be stunning. The lush courtyard gardens, organically vaulted ceilings and ornately framed windows and doors further encouraged us to escape the chaos of the public. 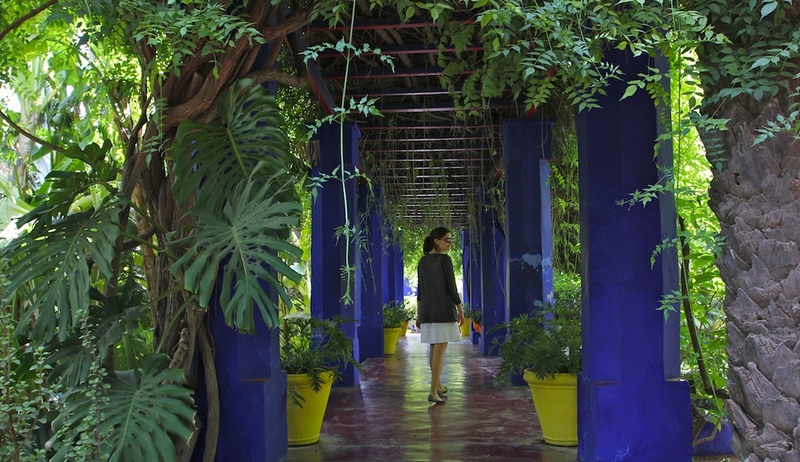 We enjoyed our excursions to the Saadian Tombs and Jardin Majorelle. While Marrakech wasn’t worth the trip on its own, our visit to Erg Chegaga pushed our Morocco segment into epic territory. 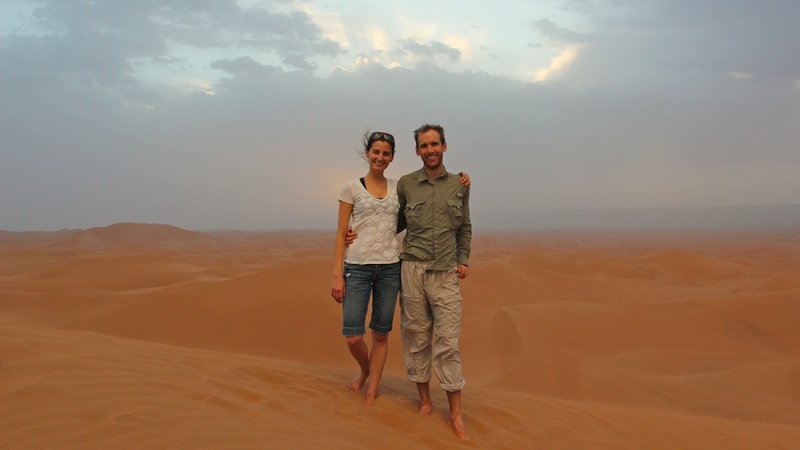 We booked a private 4-day, 3-night tour to Erg Chegaga through Sahara Services. At $500/person including lodging, meals and private transportation from Marrakech, this was an excellent deal. Most of the first day was spent driving from Marrakech to the Sahara Services lodge at the edge of the desert in M’Hamid, which they dramatically called “the edge of civilization.” It’s not a far distance as the crow flies, but you have to cross the Atlas mountains over an 8,000 foot pass. Our friendly guide Abdul picked us up at our hotel in a ~2003 Toyota Landcruiser. The drive was incredibly scenic and the auto-tune Arabic music added even more ambiance. During the drive, we stopped at a couple of kasbahs. The first one in Zagora was large, but lacked ambience being in the middle of the city. It felt a little like the tourist trap. The second kasbah we visited was the polar opposite. This underground kasbah was built in 900AD and life for its 300 residents hasn’t changed much since then. It was very poor, somewhat depressing, but worth seeing. I was a little disappointed we weren’t taken to Ait Benadou as mentioned in our itinerary, but I should have confirmed that our actual itinerary would be as advertised. 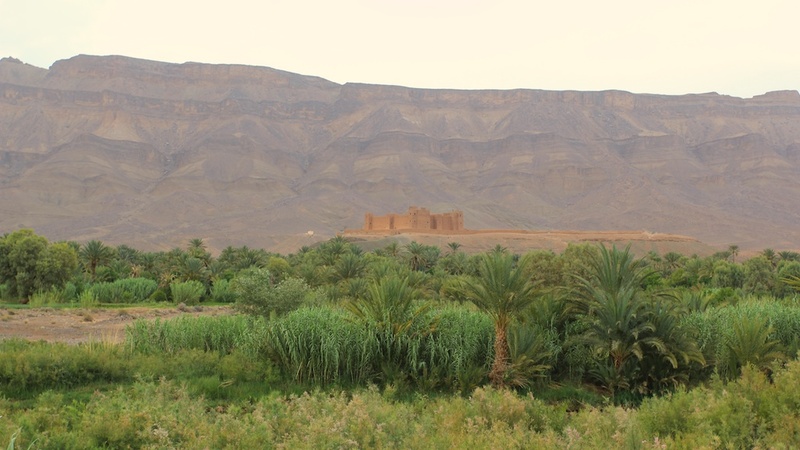 We passed by this scenic Kasbah in the Ait Bougomez Valley where Babel was filmed. I regret not requesting a stop there . 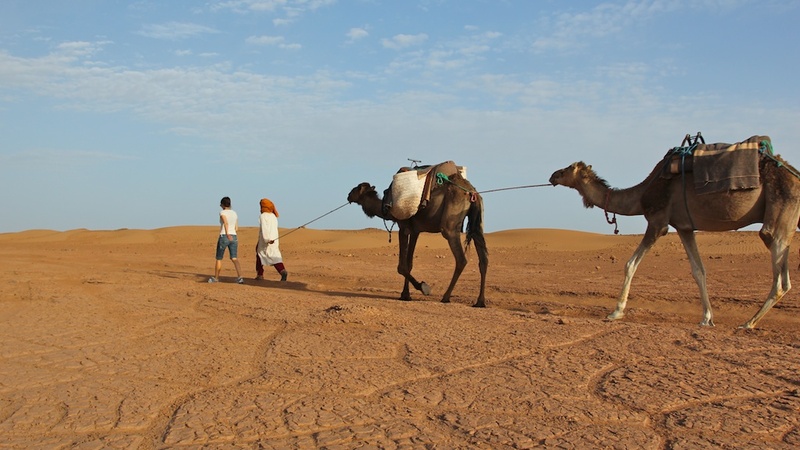 The afternoon of the second day, we began a camel trek from the lodge in M’Hamid into the “small desert”. The temperature had fallen from around 110F to 90F and there were clear skies and a gentle breeze. Our camel guide also named Abdul commented that this was perfect weather, although that would change. Setting off on our camel trek from the town of M'Hamid. As the sun went down after two hours of easy riding, a dark cloud sprinkled with lightning emerged from the North. As the cloud approached us, we were curious why it seemed to extend all the way to the ground. Minutes later we were devoured by a sandstorm. It was difficult to open our eyes with grains of sand swirling around us, but when we did we could only see about 20 feet in front of us. Then a lightning strike would illuminate both the ground and air an indistinguishable shade of orange. The silent calmness just before the sandstorm. Five minutes later rain began pouring down. Our camels started to squeal and Abdul was yelling. We saw shelter! Abdul got the camels to settle down and told us to run inside without our bags. We ducked into the rug-lined shelter gasping for breath and were greeted by cats and some friendly cooks. 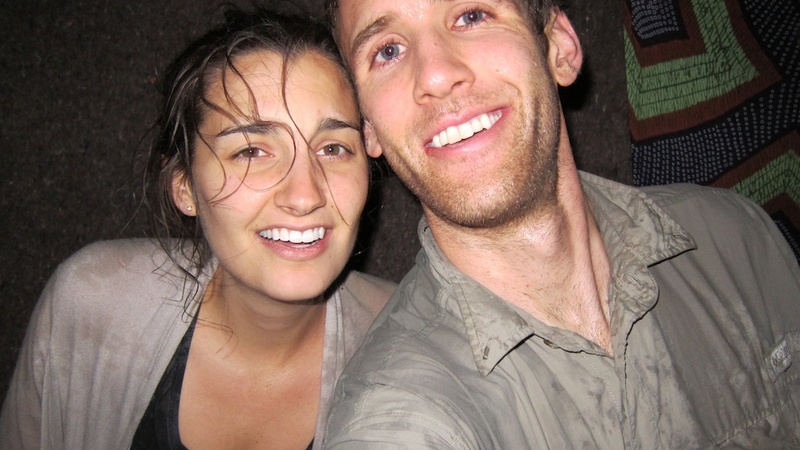 After some dry clothes, warm food and camera cleaning we were feeling quite relieved but exhilarated. In the rug-lined shelter having been soaked and peppered from the sandstorm. The next day we woke up to clear skies and cats playing in the sand dunes. Kaitlin posed in barre3 postures, and Abdul shared with us what he knew about yoga – “you hold a pose for 1 to 2 hours….and then? 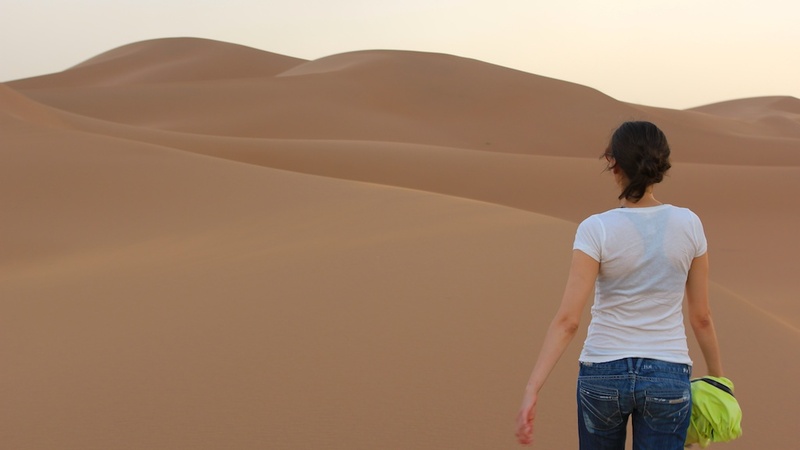 You cry.” Sore in the bottom and thirsty for exercise, we walked the camels back with Abdul instead of riding them. 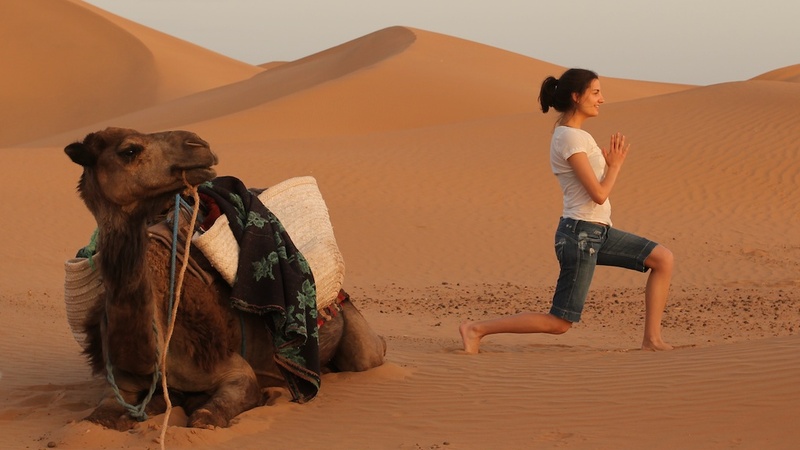 Kaitlin demonstrating barre3 "carousel horse" pose to her camel. 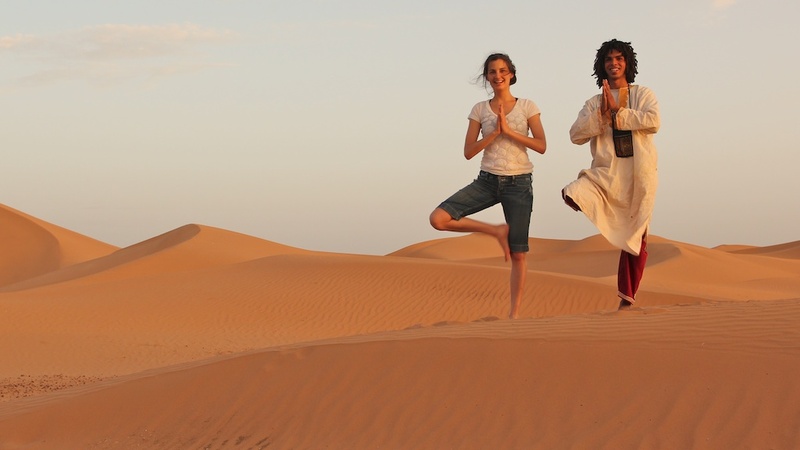 Kaitlin and our guide Abdul in "tree pose". I would have joined them if I didn't have to steady the camera. Later that day, the other Abdul drove us into the “big desert”. Drifting a Landcruiser in the sand looked pretty fun and is something I would like to try myself someday. We arrived at the Sahara Services camp at Erg Chegaga a little before 8pm with a gargantuan 300m high sand dune looming before us. We immediately began a climb to the top. The sand had cooled enough that we could hike barefoot, but the sleep sheers were physically challenging. The scenery could only be described as otherworldly. Surrounded by a maze of wind sculpted dunes. No animals or vegetation. Nothing to hear but the wind. It was like we were on the moon. We arrived at the summit and my jaw fell. It was the most incredible view I had ever seen. Infinite mounds of rolling dunes. The sun simultaneously piercing through the clouds while setting over the mountains hundreds of miles away. 75 degrees with a light breeze. Not a sign of life to be seen other than the woman I love and the two Moroccan kids smoking hash next to us. It was a perfect moment I’ll never forget and one that made the entire trip worthwhile. Me and Kaitlin overlooking the summit of the dune. 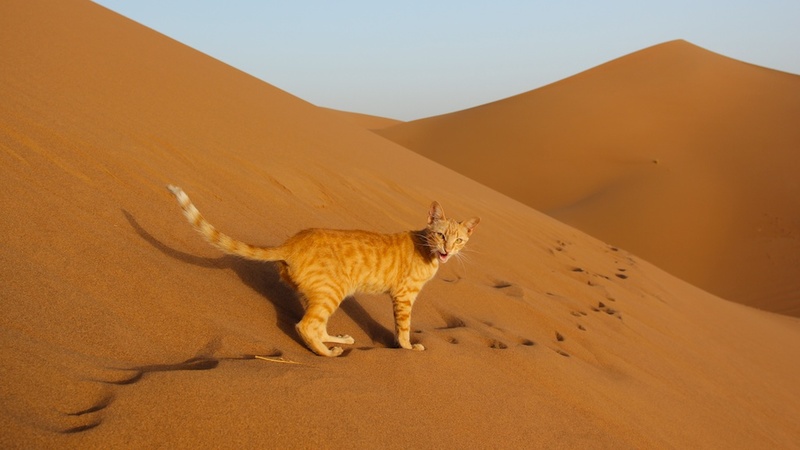 A cat from our camp who followed a fellow hiker halfway up the dune the next morning. The food was fine, although nothing worth writing home about (whoops). The produce was very fresh as Morocco has a very diverse agricultural industry. The salads and fruit juices were superb. Kaitlin, who is mostly vegetarian, was able to get by pretty easily. However, there wasn’t a lot of variety of local cuisine, frequently resulting in a binary decision between the bland entrees of tangine and couscous. As a serious breakfast person who eats eggs every day, I was disappointed by the (often stale) sweet bread I was served everywhere I went. I would excuse all of this if the food came at 2nd or 3rd world prices, but Morocco charges 1st world prices for borderline 2nd world quality. This was the first Arabic country I visited and I wasn’t sure what to expect for cultural norms, especially regarding the role of women. Kaitlin is an extremely outgoing person who loves connecting with people, but other travelers advised her not to make eye contact with local men let alone converse with them. Kaitlin promptly disregarded this advice upon arrival, but was never penalized for it. Everyone seemed happy to connect with both of us and discuss any subject ranging from Obama to Hicham El Guerrouj. Amazing trip report with an excelent Photos. we have had a wonderful 20 days in Morocco. We’ve traveled quite a bit in Europe, Latin America and the Middle East and originally planned to do the trip on our own. However, after doing quite a bit of research, we decided that our lack of language skills could make things difficult. Also, we were concerned that we’d spend half the trip figuring out how to get from one town to the next and wanted to maximize our itinerary. 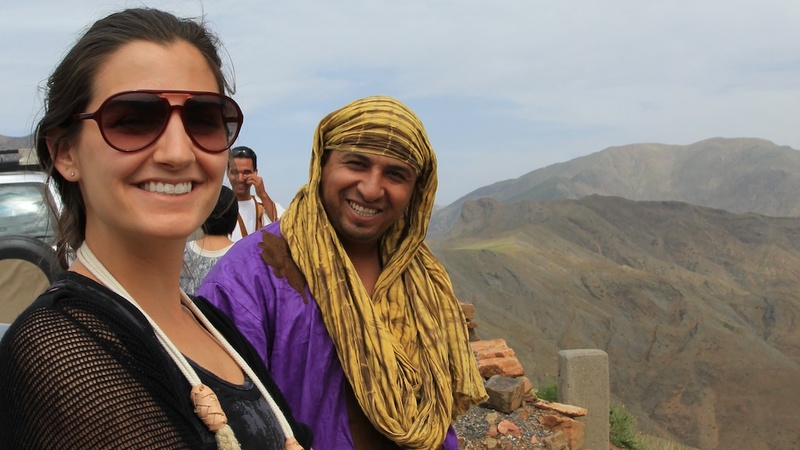 We are most definitely family group tour people so decided to go with a Moroccan based guide and I cannot imagine doing a first trip to Morocco any other way. Youssef Boujouija at Zebra Adventures Travels Tours (www.zebraadventures.com) met us at the airport in Casablanca (we took the nonstop Royal Air Maroc flight from NYC — not the world’s most luxurious airline, but it was direct) and was with us for the entire trip. He was not only our guide and driver, he became our teacher and our friend. Youssef, a Berber from Merzouga, speaks several Berber and Arabic languages, as well French,spanish, a bit of german and fluent in English. The breath and depth of his knowledge of his country’s geology, history, language and culture is amazing and his willingness to share this love of Morocco added immeasurably to our experience. With Youssef’s help we put together an itinerary that took us from Casablanca to Rabat, Chefchaouen, Volubilis, Meknes, Fes, Errachidia, Erfoud, Merzouga, the Todra and Dades Gourges, Ouarzazat, Taroudant, Essaouira and Marrakech. There was a lot of time spent in the car, which fortunately was very comfortable and air conditioned — and Youssef is an excellent Tour guide. In addition to the souks, kasbahs, and medinas there were surprises nearly every day — tea with a Berber family in their cave, henna tattoos, a rainbow over the gorge, Barbary Macaques, and lots of laughter. Because we were with Youssef, we were NEVER hassled — though I must say that even when we ventured out on our own we never felt the least bit unsafe. And the food was superb — and the best orange juice anyplace (and I lived in Florida for many years). What I’d do differently: skip Meknes; spend an extra day in Essaouria; spend more than one night in riads/hotels as often as possible and spend a couple of days at a more spa like place towards the end of the trip; bring more cash as very few places took credit cards; bring more pens/notebooks/etc. for gifts. Can’t recommending better and high quality service than Zebra Adventures Travels. Morocco is really a beautiful country to enjoy all wonders of nature and historical monuments of the imperial cities and big hills of sand dunes thousands of kasbahs also a large streched shores by the coastal cities. really enjoyable trip in a lifetime. Thanks for the Recap Sandy! That’s an impressive list of cities to see in three weeks. I’m glad we did an organized tour as well to minimize our logistical mishaps. Hi, it was an interesting blog, special because I was there and made almost the same trip in Erg Chigaga. We also hired Sahara Services and everything was to our satisfaction. But when I read in your blog on a 300m high sand dune so I decided to leave my comment here. It’s actually not 300m tall, it is actually only 120m high. They tricked you, as many others. But we have questioned the height and after much on and but they acknowledged that it might not be 300 meters high, but maybe just slightly above 100m. It’s safe and they could not only deceive another Berber because I was with my friend there and he is Berber. And they say the truth to each other. Interesting! It felt quite high, but I don’t have a great sense of vertical height (especially for triangular mounds). We had a great time there regardless. But when I read your blog on a 300m high sand dune so I decided to leave my comment here. It’s actually not 300m tall, it is actually only 120m high. They tricked you, as many others. But we have questioned the height and after much on and but they acknowledged that it might not be 300 meters high, but maybe just slightly above 100m-120m. It’s sure and they could not only deceive another Berber because I was with my friend there and he is Berber. And they say the truth to each other. I not know why they do so, but it made me a bit disappointed, to say something which is not consistent with reality. 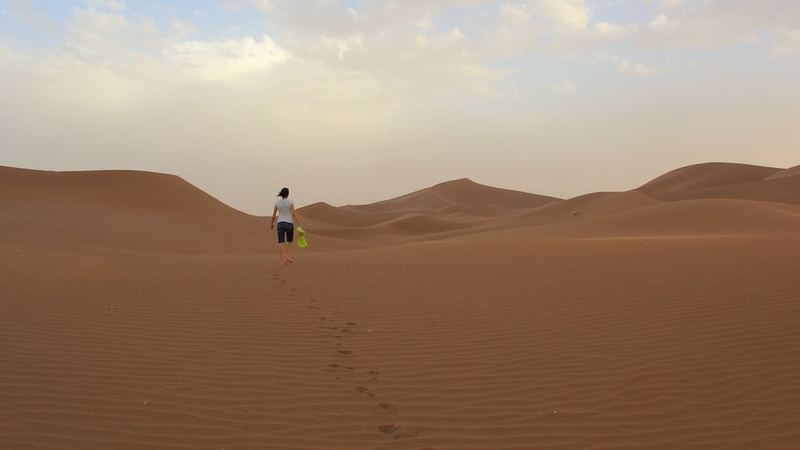 But anyway, I like very very much Morocco and just this piece of the desert, both Erg Chigaga and Erg Chebbi and must say that I like more Erg Chebbi actually. Awesome blog post and amazing pictures. Absolutely breathtaking. Sounds like you both had a fabulous time! I enjoyed reading this recap, but I was sad to hear that your foodie desires were not met. While we were underwhelmed by the food in Morocco, we had great food the rest of our trip in Spain! Just got back. Will have to update you soon! Thanks for you great blog. I am heading to Morocco this week on a spur of the moment get away (I live in northern Spain). I was surprised at the wardrobe of your girlfriend…do I not need to be so concerned with “proper” clothing? I was under the impression that legs and arms had to be covered. Like I said, this is spur of the moment, and I am trying to find answers to this…it’s gonna be August and bloody hot! I was surprised with how relaxed they seemed about woman’s clothing, at least in touristy areas with a lot of westerners. My girlfriend did get teased by some kids in the countryside when she was walking around in a tank top though. Nice picture of sand and tiger.